The list goes on, seemingly endlessly. You know there is a huge problem in our society. And you know it has to do with the unbearable pressures our culture ruthlessly exerts on women and their bodies. This problem is so pervasive it also has likely affected you personally. 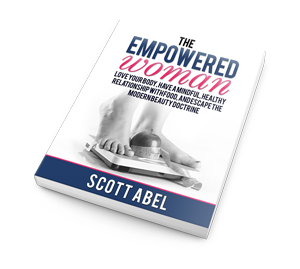 By working closely with literally hundreds of female fitness clients for over 30 years, Scott Abel has had a unique perspective into many of the psychological and body-image issues that women today are facing — often these are the issues that they are facing in silence, behind closed doors. This project began when Scott started noticing pattern among some of his clients who were really struggling with body image, their weight, and their relationship with food. He began to dig deeper. Building off his background in academia and social work, Scott looked into the latest research into health, fitness, psychology, sociology, and feminism. As part of his research, Scott also reached out to his clients. Included in this book are unedited, intimate letters and accounts from actual women who courageously agreed to share their stories and their struggles with food, fitness, and body image. These are the types of accounts you generally don’t hear about. They’re the stories we keep to ourselves. It’s one of those things, isn’t it? Even though you “know” these are deep-rooted problems in society, you still don’t like to talk about it when it happens to you. It’s the same problems that caused the struggle that also make them “embarrassing” to talk about. It’s not right. 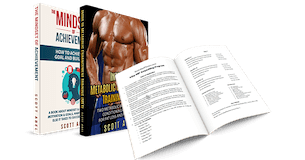 Scott’s background is in physique transformation and the fitness industry. Scott’s claim is simple: our ideas about fitness have become fundamentally flawed. For example, ask yourself: what do we mean when we say words like “fitness”? For many, it’s become some perverted idea rooted in a six-pack stomach, or a certain bodyfat percentage, or some arbitrary number on the scale, or some other external indicator. But true fitness also is also about building mental and emotional strength and endurance. It’s about what’s inside. Those external “fitness” indicators are supposed to be a reflection of having a healthy inner life. Does this sound at all familiar? Something we all already “know”? Okay… but who in the actual fitness industry is talking about it to you? What’s more — is your knowledge reflected in how you act? In other words, you know that a healthy body should go with a healthy mind, but are you actually fully living that? Have you found balance and peace of mind? Is fitness always a joyous, fulfilling and rewarding personal endeavour, or is it about using more “willpower” to avoid carbs, or to avoid emotional eating, or wondering what the heck you’re going to do at that holiday party you’ve got coming up?